Registered Jack is the meaning of the acronym RJ which is the acronym that cable connectors usually start with. Two of the most common jacks are the RJ45 and RJ11, each with their own specific purpose. The main difference between these two is in where they are actually used. 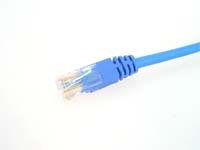 RJ45 jacks are used in networking, where you connect computers or other network elements to each other. RJ11 is the cable connector that is being used in telephone sets. Aside from the application, there are also differences that an individual can easily see and identify. The first of which is in the number of cables that are accommodated in each connector. If you look closely at both connectors, you would see that there are only four wires inside and RJ11 while there are eight wires inside an RJ45. As a consequence of having to accommodate more wires, RJ45 connectors are also a little bit bigger than RJ11s. It is then quite easy to deduce that you cannot plug-in an RJ45 connector to a RJ11 slot but the opposite is possible. Although you can plug an RJ11 connector into an RJ45 slot, you should avoid doing that because you might damage the device that has the RJ45 slot, whether it is a switch or a network adapter. This is true when you use an RJ11 connector that is connected to your phone line. The reason behind this is the power that is being delivered by the telephone company into your handset that allows it to function even during a power outage. But with proper knowledge and training, some people have been able to use RJ45s all over their house instead of RJ11s. A lot of people have begun to place RJ45 jacks on wall outlets inside their houses in order to reduce the number of visible wiring when using VoIP handsets that are rapidly gaining popularity right now. These mobile phones need to connect to your network instead of your telephone line. Usually VoIP handsets are found beside routers or computers, but having an RJ45 outlet gives VoIP phones the same amount of freedom as standard telephone sets when it comes to positioning. Ben Joan. "Difference Between RJ45 and RJ11." DifferenceBetween.net. September 6, 2011 < http://www.differencebetween.net/technology/difference-between-rj45-and-rj11/ >. Thank you very much – a clear explaination. Fine blog. Good succinct information. You are now on my desktop. Thank you for clearing my confusion. What difference between 3g and 4g?? & uses of it, if i take rj11 is it possibleto use rj45 ? I have one question for clarification about damage to a device that has an RJ45 slot by plugging in an RJ11 connected to a phone line. Wouldn’t that only be true if, as you mention, the telephone company is supplying power in it’s lines that will keep your phone working in a power outage? Wouldn’t it be safe to run both RJ45 (e.g. ethernet) and your phone through the same RJ45 slot if you have a digitized phone line such as Verizon FIOS service rather than the old fashioned analog phone service powered by a telephone company central office? “Although you can plug an RJ11 connector into an RJ45 slot, you should avoid doing that because you might damage the device that has the RJ45 slot, whether it is a switch or a network adapter. This is true when you use an RJ11 connector that is connected to your phone line. The reason behind this is the power that is being delivered by the telephone company into your handset that allows it to function even during a power outage. RJ45 Head and RJ 11 Head – 1pc. include also the lead time and freight cost going to Philippines. One sucky sucky and a love you long time. Great post, just move summary to the top and I’d give 5 stars.